I identified a Civil War soldier who had been buried in an unmarked grave for more than 70 years in Haven of Rest Cemetery in Little Rock, Arkansas. Haven of Rest is the largest African American cemetery in Arkansas (purports 10,000 burials) and it became the final resting place of prominent Arkansans, i.e., Daisy Bates (mentor to the Little Rock Nine), Scipio Jones, best known for successfully defending the men sentenced to death after the Elaine Riots (Philips Co., AR) in 1919, and Joseph Booker, first president of historical Black College, Arkansas Baptist. I was able to order a headstone for Private New and the Veterans Administration gave me a flag for presentation to the family should I locate descendants. Would it be possible to place a photo of his headstone on your website? I am hoping that a descendant might see it. Thank you for your consideration. Above "Born - 1853," tawny mildew encrusts the ivy pattern carved into Minerva New's tombstone - one of about 6,500 covering Haven of Rest Cemetery. Other etchings - "My Wife" and "We Will Meet Again" - also adorn the worn marker, but for generations no spouse's marker stood beside New's. Ten people gathered at the Little Rock cemetery to see the new white marble tombstone of Pvt. Peter New, who died in 1937, more than three years after Minerva, his first wife. Whipped by cold wind, the group huddled to learn his story from Barbara Clark-Lawrence, the genealogist who spent four months researching it. She received New's tombstone from the U.S. Department of Veterans Affairs in early March, she said. Clark-Lawrence, who selfpublished a 256-page book about the Little Rock cemetery, learned through death certificates that the unmarked grave beside Minerva New belongs to New's husband. He was born in Tennessee in 1847, federal records show. 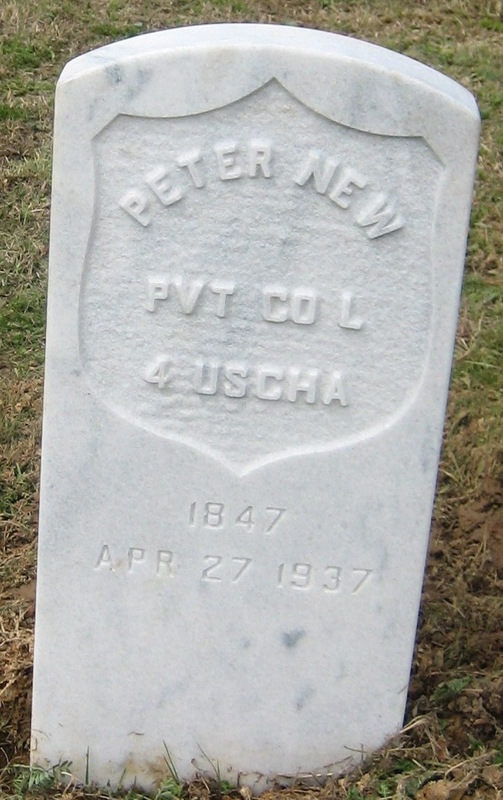 On May 31, 1865, Peter New, who was 6 feet 1 1 /2 inches tall, enlisted in Company L of the United States Colored Troops 4th Regiment (Heavy Artillery) in Paducah, in western Kentucky, more than a month after the Civil War ended, according to federal records. That regiment, however, was never stationed in Paducah, said Bill Baxter, the director of Paducah 's Lloyd Tilghman House and Civil War Museum. It formed 45 miles southwest of Paducah, in Columbus , Ky. , Baxter said last week. Baxter couldn't explain the enlistment location discrepancy between the federal records and his source document - Kentucky 's United States Colored Field Artillery (Heavy) Regiments. In June 1865, the regiment was assigned to Pine Bluff, federal records show. The black soldiers "probably replaced white units as veteran units were demobilized and sent home" after the war, said Arkansas Historic Preservation Program historian Mark Christ. Although the troops were mustered out in February 1866, New was farming in Jefferson County and had married Minerva by 1880, the U.S. Census shows. New was living in Little Rock by 1898, according to Clark-Lawrence's research of a city directory from the time, and he became a carpenter and house mover. On Saturday, B.J. McCoy, a board member of the cemetery's preservation group, said New's story "provides a perfect example of why the cemetery is more than a graveyard. It provides context about the progress of people in America ." New buried his wife in what is now "the largest African-American burial ground in Little Rock ," Clark-Lawrence said over the din of cars on nearby 12th Street . Board member Irma Brown said, "We need to maintain the cemetery in some kind way that gives respect to those interred here." "Just cutting the grass and opening and closing graves is not enough," she said. A litany of luminaries fills the cemetery's 17/2 acres, including attorney Scipio Jones, who successfully defended 12 men sentenced to death after the 1919 Elaine race riot, educator Joseph Booker, the first president of the historically black Arkansas Baptist College in Little Rock , and activist Daisy Gatson Bates, who mentored the Little Rock Nine. At 88, Peter New remarried; he died 1 1 /2 years later. He never had children. His second wife, Henrietta New, buried him in an unmarked grave he had purchased beside Minerva, Clark-Lawrence said. Henrietta New died in 1971 at age 102 in Michigan , and her family buried her at Haven of Rest in an unmarked grave within 50 feet of Peter New, Clark-Lawrence said. On Friday, Clark-Lawrence received an American flag from the Arkansas Department of Veterans Affairs to present to Henrietta New's descendants should she find them. She also looks forward to unraveling more of the secrets buried among Haven of Rest's estimated 3, 500 unmarked graves. "I plan on continuing to do research here because I don't think I've even touched on the story."